iPhone Fever. We know you've got it — so do we. 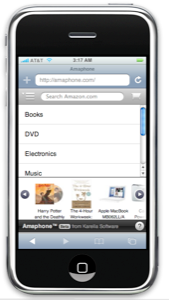 Today, to coincide with the launch of the iPhone, we are announcing Amaphone™, the easiest way to browse and shop Amazon.com on an iPhone. This was a natural new project for us. Users of Watson may recall its valuable front-end to Amazon.com, and Sandvox users have by now discovered the ability to build Amazon.com content in your own Website, using a dynamic inspector for loading and displaying items from the Amazon stores. Amaphone uses the same technology that Watson and Sandvox do to retrieve content directly from Amazon and display it without the clutter and long waits for pages to load. For readers who don't yet have their own iPhone, don't fret — you can still simulate the experience by visiting amaphone.com from your desktop (Safari-only for now) or the cool iPhoney application (Be sure to set 'iPhone User Agent'). As more people get their iPhones, we expect to get some good feedback about Amaphone. The application includes a button for emailing your comments directly from the iphone.